Labour Party leader Jonas Gahr Støre fended off criticism during the weekend that he’s been vague and unwilling to take firm stands on important issues. He failed, however, to quell criticism, also within his own party, that he’s catering far too much to the interests of potential centrist partners in his zeal to become prime minister. Støre “met the demands” of critics who’ve called him “foggy,” declared political commentator Arne Strand, noting that Støre was unusually sharp in his opening address on Thursday. Støre’s message was clear: Norway needs a new Labour-led government in order to preserve its social welfare state, and he’s more than ready to take over the job of current Prime Minister Erna Solberg from the Conservatives. 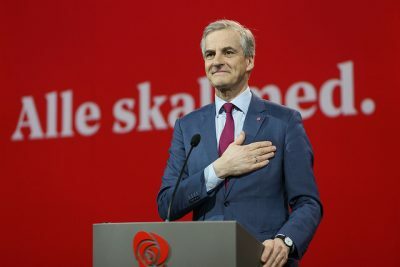 Støre avoided touching on the two most troublesome issues in his opening address, though, that threatened to split his own membership and on which his Labour leadership and the Conservatives actually agree: drilling for oil off Lofoten in Northern Norway, and retaining strict immigration and asylum policy. Both Solberg and Støre, for example, want to let the oil industry expand offshore operations in waters that not only are located close to some of Norway’s most scenic tourist attractions but also contain some of Norway’s and the world’s richest fishing stocks. Støre later got his way on that one Saturday, through a so-called “compromise” worked out among Labour factions earlier this year, much to the disappointment of environmentalists demonstrating outside. Støre also adopted a creative means of justifying the Labour leadership’s call for mostly retaining Norway’s currently restrictive asylum and immigration policies, which have been hammered out in large part by his arch-rivals in the Conservative and Progress parties. He argued, aided by the head of Labour’s sister party in Denmark, that strict asylum policies were important in the fight for social equality in Norway, because inequality has increased along with immigration. Støre welcomed Mette Frederiksen of the Danish social democrats, who claimed that “we must have control over how many (asylum seekers) come, to make sure that folks get jobs, that children get an education and that we have a common language so we can understand each other.” In a speech that resembled those delivered by Norway’s current and controversial Immigration Minister Sylvi Listhaug of the conservative Progress Party, Fredriksen also called for “a positive form of nationalism” and said countries like Denmark and Norway need to be proud of their welfare states. Dagsavisen reported how Støre himself declared from the podium that “we should not change (current) laws and regulations that would send any signal that Norwegian policies are changing. Because they should not be.” Other forces within the party wanted to soften policies, especially the controversial forced returns of young asylum seekers when they turn 18. Labour veteran Martin Kolberg called that “undignified,” and in the end, the party compromised by voting to retain current laws but easing the use of only temporary residence permission for minors. 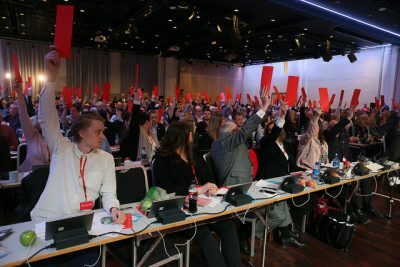 Labour’s annual national meeting resulted, however, in two major policy losses for Støre. His party fellows failed to go along with his leadership team’s proposal to retain Christianity as a separate area in the state’s primary school curriculum dealing with religion, lifestyle and ethical studies. The proposal seemed aimed at luring support from the centrist Christian Democrats, if needed, to help form a new government along with the Center Party after this fall’s election, assuming all three do well enough to unseat the current conservative government. Støre’s open courting of both parties, however, is controversial and would require the Christian Democrats, who currently support Solberg’s conservative coalition, to switch sides. Støre’s other loss involved Labour leaders’ plan to reduce the number of years young unemployed Norwegians can receive financial assistance, from four to two. That met dissent from the rank and file, and the reduction was not approved. Several other policies were approved that are directly in line with what the Center Party, Labour’s most likely government partner, wants, not least banning the use of force in merging municipalities around Norway. The current conservative government has been on a campaign of municipal and local government reform, to reduce the number of municipalities in Norway, streamline government services and, the conservatives claim, save billions in the process. Labour favoured forcing mergers itself in the past, to reduce bureaucracy and the public sector payroll, but now is siding with the Center Party in its opposition to reducing local governments in rural areas. Labour even claims it will reverse forced mergers if it wins government power. In other areas, Labour’s annual meeting approved boosting defense spending to 2 percent of GNP by 2024 (to satisfy NATO commitments), to mandate the number of pupils per teacher in primary schools, and to impose a new form of after-school programs at schools nationwide. The party also aims to reverse the current government’s agreement with the Netherlands to lease prison space, since Norway lacks enough jail cells of its own, without presenting a clear alternative. Labour’s agenda will be expensive so it unabashedly intends to raise taxes by at least NOK 15 billion during the next four years. Støre was re-elected as Labour’s leader for the next two years as were his two deputy leaders Hadia Tajik and Trond Giske, who both are also Members of Parliament. There were more voices of dissent, however, especially regarding Støre’s project to form a new left-center government with the regulatory- and protectionist-minded Center Party and, if needed, the Christian Democrats. Labour is turning far more to the center (and thus becoming more conservative) than to the left, having all but rejected the Socialist Left party (SV) as a potential partner. Some Labour veterans, including former minister Gunnar Berge, warned Støre against placating the Center Party by reversing municipal mergers that were arranged by force. Berge forced through several mergers himself during the 1990s and still believes such reform is necessary, especially when two municipalities want to merge but a neighbouring third doesn’t. He mostly fears that more state funding will be sent out to the districts than to the cities where it’s most needed. He said three of Oslo’s districts have unemployment rates as high as areas hit by the oil price collapse, that Oslo needs new job creation just as much as outlying areas, along with new train and metro tunnels. “Building a tunnel for ships off the west coast may be fine, but there’s always a fight for funding,” Johansen told DN. “We can’t hang on to the Center Party leader’s rhetoric that everyone who lives in Oslo is public enemy number two,” Johansen added, noting that “the wolf is the Center Party’s public enemy number one.” Johansen has Labour’s own strategic interests in mind, too, since most of Labour’s core voters live in Norway’s cities: “Our political agenda going forward cannot just be tied to ‘district’ being a positive word and ‘centralization’ a negative word.” Neither Johansen nor Frode Jacobsen, head of Labour’s Oslo chapter, want the Center Party to get too much power in a new left-center government.